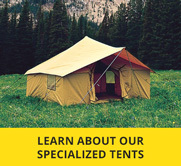 Choose from three standard wall tent options. 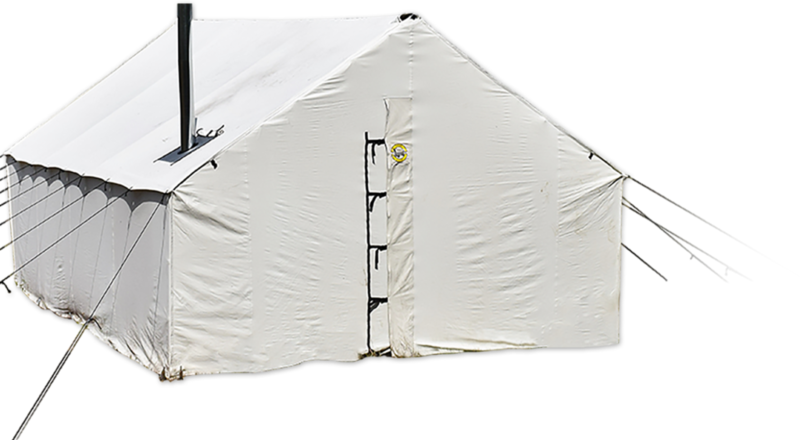 For a level of toughness meant to withstand the test of weather and time, our 10 oz., treated, Grade ‘A’ canvas tent is the perfect option. With a finished weight of nearly 15 oz. after undergoing our proprietary treating process, this material is one of the heaviest on the market and is the main reason our flagship product remains so popular to this day. Long stays and harsh weather? Our Premium tent, the older brother of the Traditional, has your back. After undergoing our proprietary coating process, the fabric finishes at a hefty 18 oz., making it the ideal choice for professionals, outfitters, and anyone else who’s in it for the long haul. If weight is as much a concern as durability, we offer a lighter option that brings you the best of both worlds. We call it our Montana Blend. In this construction, the roof is 10 oz. canvas, while the side walls and end walls are a lighter-weight, 250 D Relite, fully-coated polyester. It weighs in at around 40% less than the Traditional. 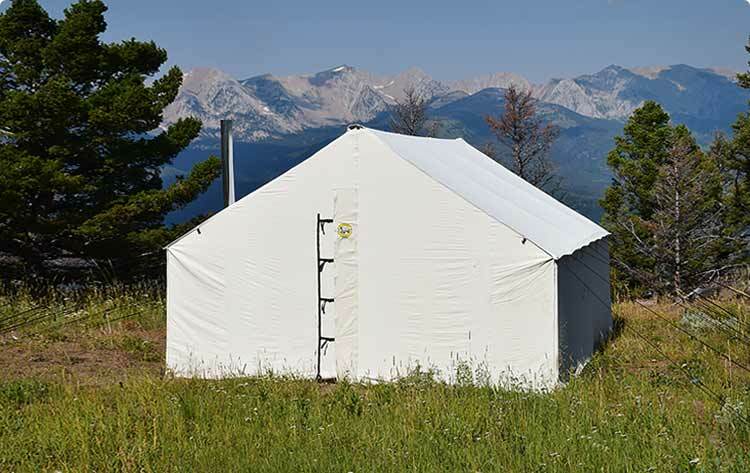 Save big on setup time with one of our Montana Canvas aluminum frames, which can be used in combination with a tent you already own or with any one of our Montana Canvas wall tents. The patented adjustable frame joints and snap buttons hold the frame in place,making for easy setup. Featuring a 1.375” cast aluminum alloy construction reinforced with a 1” steel conduit and cast aluminum frame joints, the Montana Canvas frame is made unique with its patented adjustable hinge system that will make your life easier.It’s the weather-resistant, sturdy design you’ve been looking for. Our tent floors, constructed using 10 oz. 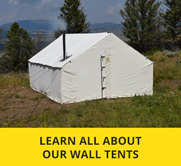 laminated white vinyl and featuring a 5′ x 5′ cutout for stove placement, are a great addition to any wall tent. 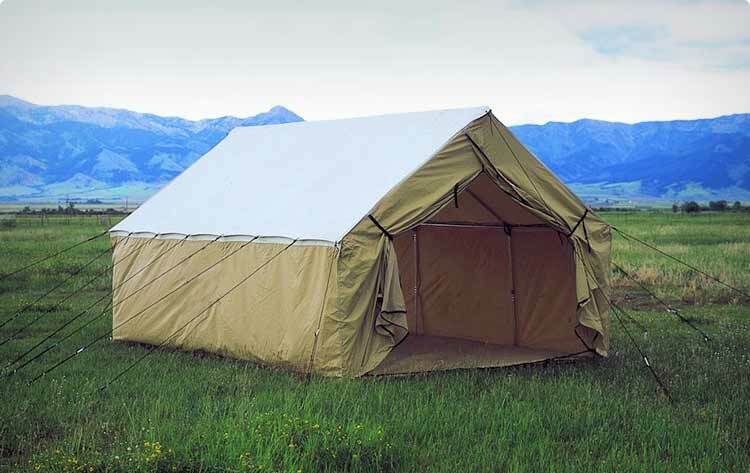 Our Montana Canvas tent fly’s come in two different options.You can choose from a lighter weight 250D Relite Tan polyester or a heavier duty PVC Tan vinyl.They both extend 18″ off either side of your tent to add maximum protection from the elements. 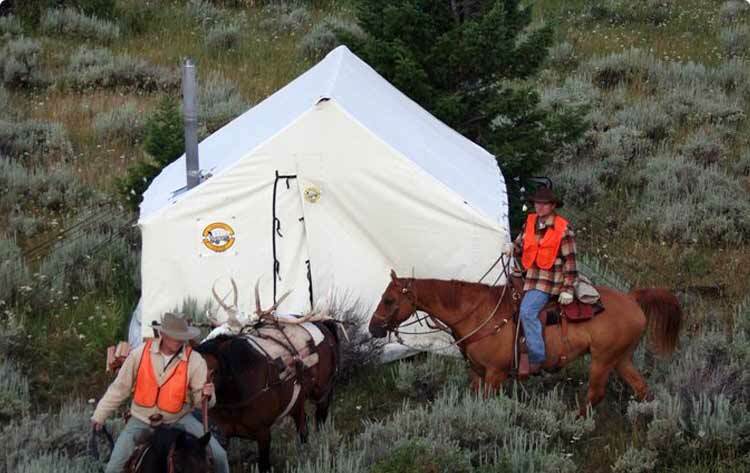 Wall tents provided shelter from the most severe elements for our early pioneers, trappers, miners, and hunters. The legacy of the wall tent continues today. Our new and innovative designs insure our customers of the highest standards of construction, materials and comfort. Our wall tents have passed the test of time, with families handing down tents from one generation to another, along with precious memories. 5” stove jack, complete with a weather flap, is designed to withstand the extremely high temperatures associated with the use of a single wall stove pipe inside the tent. Screened window located in the back wall of the tent measures 24” tall x 30” wide, featuring protective mesh that will keep the tiny insects at bay. It can be fully closed from the inside of the tent. End wall seams using six layers of double lock-stitched canvas. Sidewalls are a standard 5’ Tall. Doors measures 7′ 6″ in height when fully opened. The door features heavy duty zippers and a generous weather flap, and can be easily secured open with webbing and side release buckles. The base of the tent is reinforced with webbing and contains heavy duty brass grommets, so that you can stake your tent from the inside or outside. Tent features sod cloth for a weather tight seal. 12” outfitter-grade ‘V’ style steel tent stakes. Complete with 200’ of ¼” black polyester rope and rope tension adjusters. Repair kit and set up instructions.